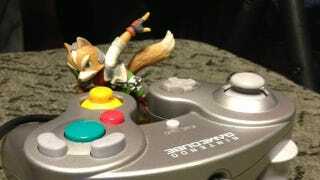 A Fox Amiibo—as in, a CPU-controlled version of a character housed in a tiny action figure—took third place in a Smash Bros tournament against real humans. It was a Fox Amiibo. Of course it was Fox. Twitch streamer dazee recounted the tale in a series of tweets (as spotted by NeoGAF). At a local Smash tournament in Richmond, British Columbia, a Fox Amiibo named WaveShine rose through the ranks and nearly took the whole thing. He (or she? I don't know how Amiibos process gender in their cold, plasticine circuits) made it all the way to the losers finals, taking on one of the best Smash players in the region in the process. Just look at it, sitting motionlessly in front of a controller, scheming. Has science finally gone too far? Robots already took chess from us. Now this? Does humanity's future lie not in the lap of technology-borne luxury, but rather in the clammy iron grip of an army of elite combat action figures, our own metaphorical Final Destination (no items, naturally)? I'm joking, of course. And it should be noted that high-level Amiibos get some pretty serious boosts to damage and other stats. This wasn't really a fair fight. Even if an Amiibo's AI isn't perfect, it still packs a mean(er than normal) punch. Still, it's pretty funny. I also find it fascinating, because we continue to see Amiibos being used in ways I doubt Nintendo intended. I have to admit, I wasn't sold on the concept at first. All I saw was a cheap Ninty knock-off of a concept Skylanders turned from cheap to plastic to pure gold. Conceptually, though, these things pair pretty perfectly with Smash. Fighting game players frequently refer to "their" version of a character—the unique fusion of that player and character's identities—and Amiibos are a physical extension of that. I finally gave into my "alright, this is kinda neat" impulse when people started customizing them. I gave into my nightmares about Animal Crossing's villager shortly after. Now, to add to that, we have an instance of an Amiibo doing its own thing... shockingly well. I think it's time for an all-Amiibo tournament next. Seriously! I think it'd be really cool if people tweaked and tinkered with Amiibos specifically to make them compete against each other. And then we'd see professional Amiibo trainers, Amiibo gyms all over the world, a series of badges you'd earn for defeating them and wait I just described Pokemon. But the first thing I said—the tournament stuff—that'd be dandy.